A very astonishing and recent statement which tries to explain the arctic warming in the 1920s says: “Needless to say, a necessary condition for the Arctic warming event to happen depends on the change in the larger scale atmospheric circulation”. This statement is putting causation and event in the wrong order. The atmospheric circulation is not only the weakest weather making aspect, but it depends on water vapour, sun radiation and the status of local, regional and global seas. Nevertheless, the ‘confusing’ sentence points indirectly to the weak areas in understanding the global short and long-term weather making conditions, namely the very limited knowledge of the oceanic internal conditions. As this did not exist at all in the first half of the 20 th century, there is little one can do but to extrapolate from weather data the forcing mechanism, if possible. 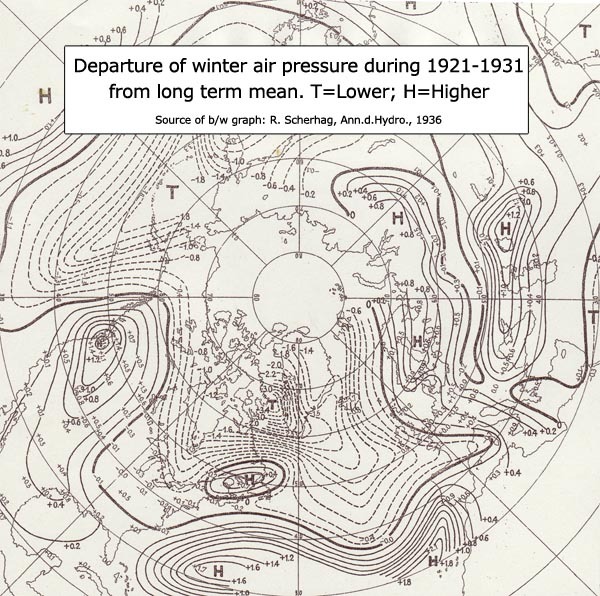 In so far, atmospheric circulation is only one tool weather statistics may offer. 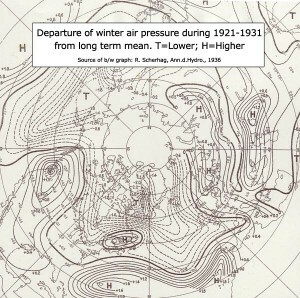 The meteorologists in the 1930s had already considerable skill and paid considerable attention to this matter, as the reproduced graph by R. Scherhag indicates. But temperatures are a more interesting part of the pool of weather statistics, and they will be the main tools in our investigation. It may be reasonable to have a look at more general data series concerning the arctic warming. The most general is either the global, or the Northern Hemisphere temperature development. As the Southern Hemisphere will not provide any clue on Arctic warming, the Northern Hemisphere seems to be enough, as the present graph shows it. Although a rapid rise occurred at the end of the 1910s, it tells only that one half of the earth experienced higher annual temperatures. This is an interesting fact, but it explains little, because it covers a huge area and any summarized presentation of summer and winter temperature disguise quite often any significant detail. This is well illustrated by the two further graphs. 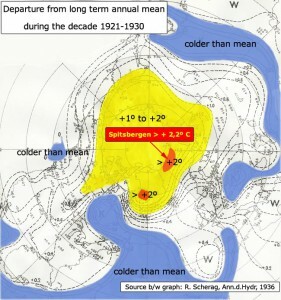 The Scherhag temperature graph for the decade 1921-1931 provides at least two principle information: (1) Only the Arctic region showed a strong warming trend; (2) Only the narrow region between the North Atlantic and the Arctic Ocean warmed up exceptional. The Hesselberg & Johannessen graph provides a unique demonstration on how different seasonal anomalies can and have occurred. 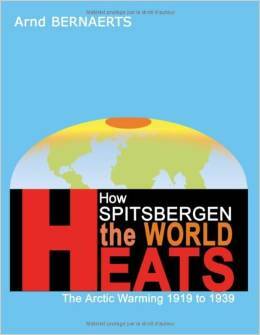 Therefore it seems reasonable to concentrate on higher latitude temperature observations in order to focus on the goal of the investigation: Can the Spitsbergen warming be explained. Lennart Bengtsson, Vladimir A. Semenov, Ola M. Johannessen, The Early Twentieth-Century Warming in the Arctic—A Possible Mechanism, Journal of Climate, October 2004, page 4045-4057.